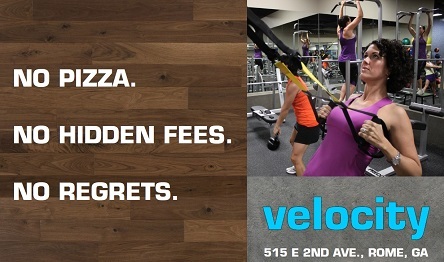 Velocity is a locally owned and operated 24 hour access, 22,500 square foot gym conveniently located in the heart of Rome. We want to earn your business by consistently providing you the best equipment selection, customer service, cleanest facility and great classes. Velocity is a gym for everyone with a friendly, non-intimidating environment. No matter if your are starting your fitness journey for the first time or are a long time fitness fanatic Velocity is the place for you! We invite you to stop by Velocity for a tour to let us show you what we have to offer to fit your specific fitness goals. We are happy to answer any questions you may have. We do not use high pressure sales tactics, specials or gimics to convince you to join! Our fee structure is clear and easy to understand. Membership at Velocity is very affordable. We do not charge for the extras - as a member everyone has access to the same services and is paying the same rate. You don't have to haggle to get a good price! Making an appointment is never necessary. You will never be charged any hidden fees or a yearly maintenance fee at Velocity. Joining Velocity is simple, easy and hassle free - the way joining a gym should be.